RHYTHM: Repetition of an ELEMENT. ORGANIC: are the types of lines and shapes found in nature. They are irregular, curved, and often fluid. They convey a sense of gracefulness, dynamism, and spontaneity. GEOMETRIC: lines and shapes have regularity and hard or sharp edges. True geometric lines are rarely found in nature, but often found in man-made constructions. 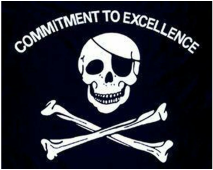 They convey a sense of order, conformity, and reliability. Fill the first 4 boxes with LINE PATTERNS. Two boxes using ORGANIC line patterns and two boxes using GEOMETRIC line patterns. Fill boxes 5-8 with SHAPE PATTERNS. Two boxes using ORGANIC shape patterns and two boxes using GEOMETRIC shape patterns. Fill boxes 9-12 with four different type of checkerboard patterns. Demonstrated in class. 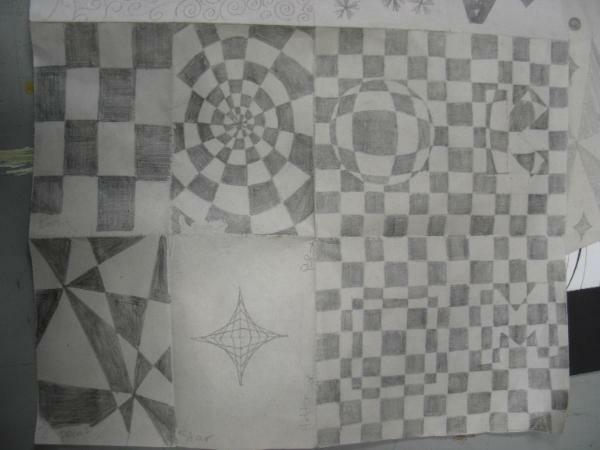 In boxes 13 and 14 practice camouflaging two different types of 2D shapes into two different types of checkerboard patterns. In boxes 15 and 16 practice camouflaging two different types of 3D shapes into two different types of checkerboard patterns. The boxes 13-16 in the example only show the use of one basic checkerboard pattern. Students need to demonstrate two. Value: The range of light to dark in a drawing. The two extreme values are black (very dark) and white (very light). A painting or drawing with only mid-tones risks being flat and dull. Value or tonal contrast creates visual interest or excitement in a work of art. 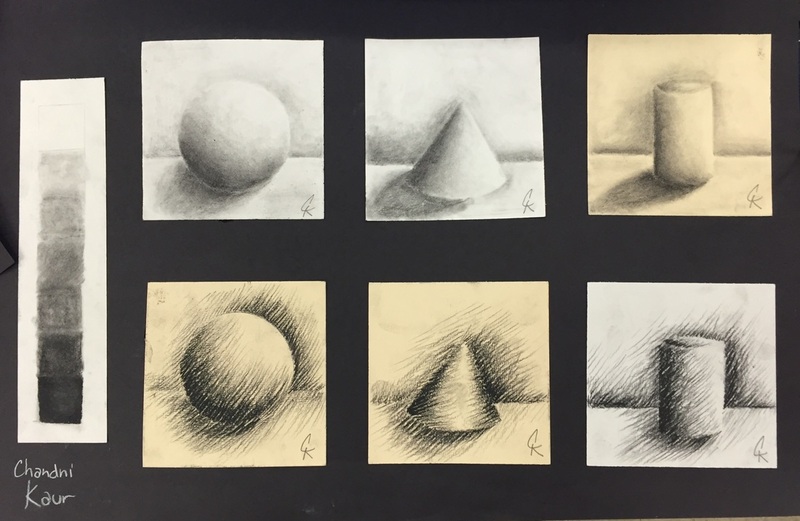 A high-key drawing is one in which the contrasts in value are extreme, from black right through the range of mid-tones down to white. A low-key drawing is one in which the value range is narrower. Draw shapes and table lines lightly with a #2 pencil to avoid a dark lines you can't get rid of. No outlines. All edges are changes in value. Value: The scale should have a clear and distinct difference between each box. Use the entire value scale in each shape. 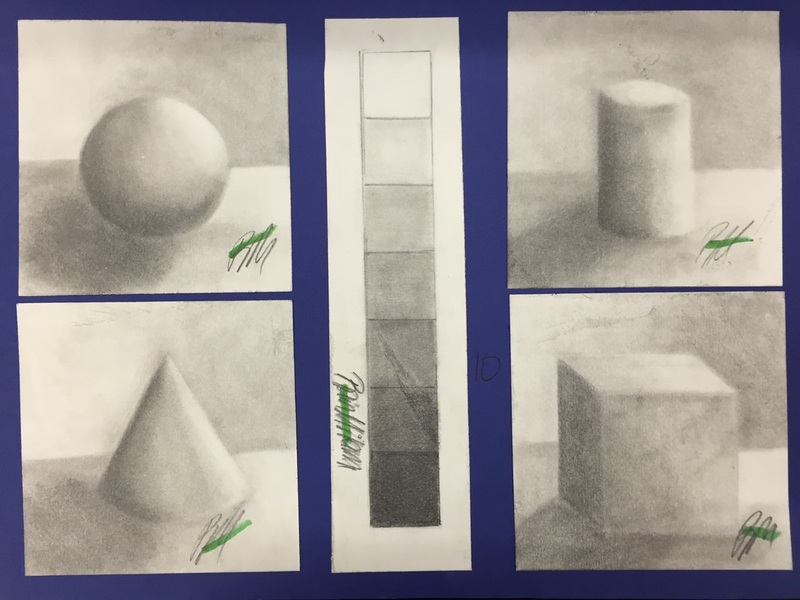 All shapes need 1/3 dark, 1/3 medium and 1/3 light VALUE including white. 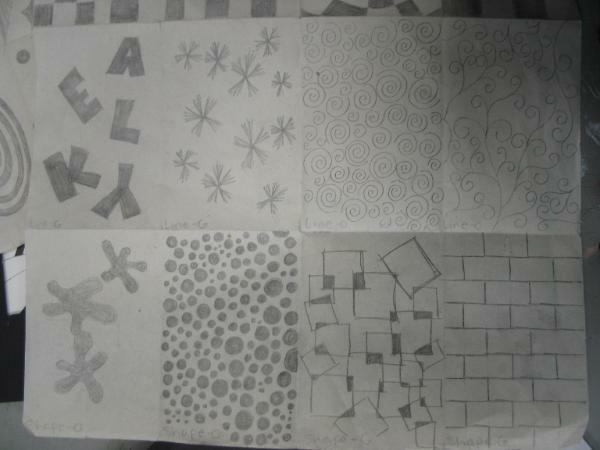 Repeat shapes using HATCHING as a form of mark making. Repeat ALL Using WHITE CHARCOAL. 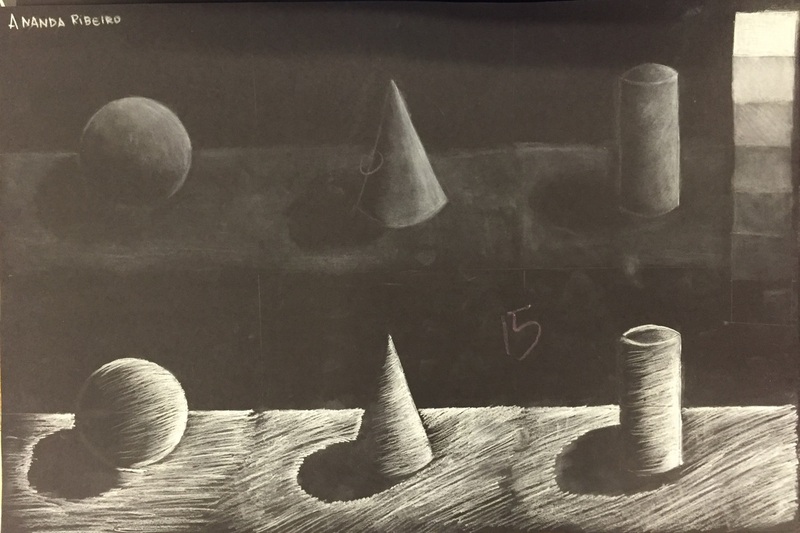 Students are asked to think "highlighting" instead of "shading" when using white charcoal. Stipple is a form of mark making. 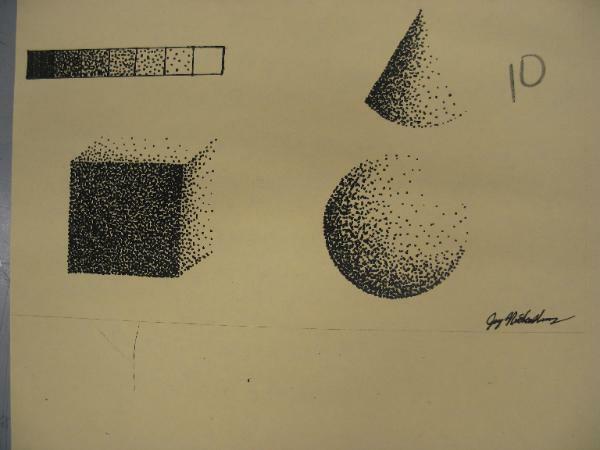 Student will use a sharpie to make small dots for all values including black.